As a consultant, you can putter along, earning a reasonable income if you’re blessed with innate charm, passion for your practice or considerable chutzpah. 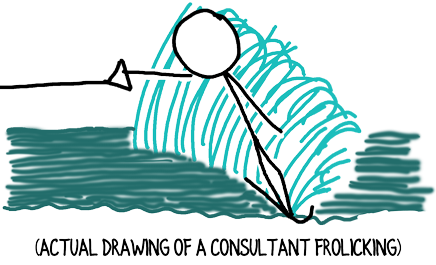 But what truly allows some consultants to consistently succeed in winning projects, in attracting clients, and in commanding higher fees? Take 60 seconds to watch the video below and share the vital lesson I learned one Summer in North Carolina. The water-skiing story obviously wasn’t meant to teach you techniques; rather, I want to underscore the importance of learning them. You can improvise and use natural ability up to a point. But those who use good technique will always shine brighter, earn more, and ski a shorter rope. And skiing closer to the boat not only wins you competitions, it’s more fun. You know you’re stretching to your limit, and succeeding. You’re winning larger projects from more clients than thought you could. What’s required? A disciplined approach to learning and improving. An example: I knew I wanted to improve my writing. Writing is one of the Five Marketing Musts that attract clients. Plus, I know from the movies that if you jot the correct words on a piece of paper and hand it to a bank teller, you’ll receive thick bundles of cash. Wow! Now, how to learn? Two of the best business writers I know are Chip and Dan Heath. Since they weren’t likely to teach me directly, I painstakingly deconstructed a few of their articles and identified a handful of lessons. Then I carefully studied the lessons, practiced, sought feedback, and practiced more. Every week I solicit coaching and improve a bit more. The same goes for speaking, and virtually every other aspect of my practice. What techniques should you be learning to ski closer to the boat in your consulting business? I quickly thought of a dozen critical techniques just on the business development side, but I’m going to start the list with only six. Please tell me the techniques you think are essential to master (by adding to the comments below), and I’ll add them to the list. Indispensable for creating impact, building trust, and conducting discovery. Mastering at least two of the Five Marketing Musts is necessary to attract clients. Jabs to the heart are a regular part of consulting. Resilience techniques are critical. Done correctly, this discovery process makes you the obvious choice for your clients. Like alchemy, this technique transforms your relationships into projects. A simple, yet wildly important part of winning business is keeping the prospect on the hook. What else? What did you expect to see on the list of business development techniques that wasn’t included (yet)? David, you and I have had many conversations on this topic and I know that you think the average consultant may not be able to replicate my level of performance. Are there techniques I used that you would put on the list? Rick, while not everyone can achieve your level of success, you model many techniques that others can emulate. In fact, astute readers will notice you’re called out twice in my new book (available soon electronically, and in the Spring in hard copy). The first place you’re called out is for listening to the market to find a specific, unmet need, then specializing in that unmet need. That is an approach that combines a number of vital techniques including listening and one I hadn’t listed in the article above: Maintaining Focus. The second technique of yours I’ve mentioned elsewhere is what I’ll call the Light, Compelling Touch. This is your use of very short (1-2 line) emails to your contacts that result in face-to-face meetings and that move the pipeline forward. Thank you for being willing to share your successful approaches with the community, Rick. How did you go about seeking coaching for your writing? Darnley, coaches abound for virtually every field of endeavor, including writing. If you want to engage a writing coach, find someone who has achieved with their writing what you’re aspiring to achieve. As a more general comment, sometimes it pays to hire a coach/mentor and sometimes it’s not in your best interest. The more tightly an activity is tied to your success, the more sense it makes to bring in a professional guide. For a consultant, business development, client acquisition and scaling are so fundamental to success that engaging outside mentoring should be a non-negotiable expense. Other coaching–for instance on presentation skills or writing–is discretionary. I’d love to learn and master a technique, better yet a set of them, to initiate and sustain the first 10 min of conversation with a new prospect. One would be, as you have taught, to seek expert advice following somebody’s referral. Anatoli, that’s an excellent suggestion. Establishing a new relationship can be awkward and if there isn’t an instant connection, those first ten minutes might feel like ten hours. One quick thought for you: rather than thinking of someone as a new prospect, think of them as a new contact or even a new friend. When you go into a conversation with an intention of selling, it can be off putting for the other person and for you too. What are your thoughts on that?